Bella Sugar Cosmetics is having a 50% off birthday sale. The sale has been extended through the end of the day Sunday. As long as the weather cooperates, I will be putting some swatches up of the Wildflowers Collection this weekend. You can view my swatches of Chocolate Covered Blueberries, Coltt, Morning Glory and Gaillardia in this post with a duochrome eye look. I also show Clearwater, Bad Girl, Bella Sugar and Sweet Pea here with a bright and dramatic cat's eye. There's also a new birthday promotion. If you leave your date of birth (the month and the day alone will do) along with your order, you will be registered to receive a full size shadow on your birthday. The shadow will be selected based on order history, so you won't receive a duplicate. See this post for details about the Birthday Program. You can view more swatches at the Bella Sugar Cosmetics Blog. My favorites are Chocolate Covered Blueberries, Coltt, Pretty, Grassy, Luck O' The Irish, Emerald City, Bella Sugar, Sweet Pea, California Poppy and Smolder. To purchase, visit their etsy shop or bellasugarcosmetics.com. 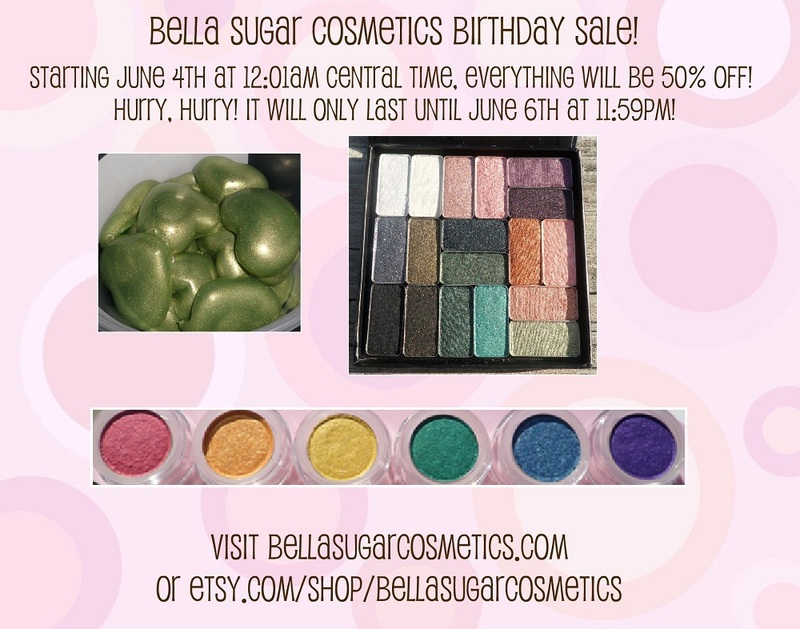 If you see a color you like that is not listed, send a message through etsy or e-mail: bellasugarcosmetics@yahoo.com. Their customer service is very personable.